Honda EU1000i generator- Whether you’re going camping, preparing for rough weather, or just want a backup power source, finding the right generator is important, especially since it can be critical to help your family. Honda is known for their quality and their reliability. The Honda EU1000i generator is no exception. This reliable, small generator has some amazing benefits. You will find many ways you’ll want to use it. Here are the 10 things you should know about the Honda EU1000i generator. Learn why it’s a good choice if you are looking for an excellent small generator. If you aren’t an expert on generators, looking into buying one can be extremely confusing, especially since there are multiple types of generators made by many different brands. There are three basic types of generators: Conventional, Silenced, and Inverter. Are very popular; they’ve been around for a long time. They can run on diesel, gas, or propane. Usually, they are quite loud, large, heavy and powerful. They have an enclosure around it in an attempt to reduce their noise. Because of that enclosure, silenced generators tend to be bulky. They can be powerful and large. Like the Honda EU1000i, are actually quite new technology. This type of generator creates an AC output, then converts that to DC, and then that DC is inverted back to AC. This allows the generator to produce a constant, steady flow of electricity. The Honda EU1000i inverter generator provides many benefits because of the inverter generator technology. Inverter generators tend to be smaller and quieter; they also provide “cleaner” power compared to the other types of generators. The clean power produced by inverter generators allows you to safely power electronics like computers, plasma television sets, and phones. If you tried to use other generators to power those electronics, you could damage them and even cause them to break permanently. Inverter generators are much quieter than conventional generators, and they’re even quieter than silenced generators. This Honda 1000 watt generator is no exception. It’s low noise level is one of the benefits of this machine. Even when using all of its power, Honda generators are extremely quiet. The noise can range from 53 to 58 dBA, which can be compared to the noise level of conversations in a restaurant. Many describe it as quieter than a regular conversation. This is remarkable considering conventional generators can get up to 120 dBA, which is comparable to a chainsaw. The quietness of the super quiet Honda 1000 watt generator makes it perfect for camping, parks, and home use. It won’t disturb your neighbors or damage your hearing, which louder generators can do if on for long periods. Another benefit of this inverter generator is the fuel efficiency. When running 1/4 load, it will use up the entire fuel tank (0.6 gallons) in about 8 hours, which shows just how efficient it is. Even at the highest load, it will still last a bit more than 3 hours on just one tank of fuel. It doesn’t output large amounts of fumes, which is another plus. You’ll be able to use the Honda EU1000i for a much longer time than some other generators, with little fumes and less fuel. While this generator doesn’t have an electric start or an internal battery, the pull-start system won’t give you any trouble. People describe starting this machine as easy and effortless, even if it hasn’t been touched since last winter. Simply grip and pull the starter. Be careful not to let it accidentally recoil back and hit the machine. It will likely only take one try, which is a huge bonus of the Honda EU1000i. You will want to use this generator when the power goes out, so you want it to work right away, without causing any stress. The days of pulling the starter 10 times to no avail are over with this generator, making it reliable and fast to start. It will be ready to work when you need it to. While this isn’t the most powerful generator out there by any means — like the Honda 7000W — for a generator of this size, it provides excellent, clean power. The Honda EU1000i has a peak power output of 1000 Watts with 120 Volts AC and 8.3 Amps. You can also have a DC output if you are connecting to a car battery. There are obviously other small appliances and electronics you can power with this generator, but those cover some of the basic ones that you might be using with a generator of this size and power. Because the power levels aren’t extremely high, you won’t be able to power some larger appliances, like fridges, air conditioners, or freezers. It also won’t be able to act as the sole backup generator for your home. Like other smaller generators like this one, you also have to be careful with plugging in too many things at once, as this could overload the generator. 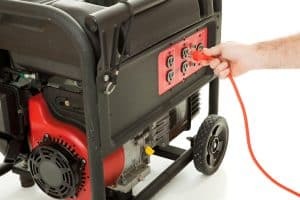 So while this generator would be great for backup power for specific electronics and appliances during short outages or during camping/outdoor trips, you would be better off getting a larger, more powerful generator if you’re looking to run large appliances or provide a true backup power source for your house. The Eco-Throttle technology is exclusive to the EU series of generators by Honda. It adds to the noise reduction and the fuel efficiency of the Honda 1000 generator. It basically works to make the engine of the generator run slower in certain situations. For example, when it’s not using the maximum amount of power, or when the generator is connected to only a couple of things. This helps with reduce noise levels as well as with fuel efficiency. Specifically, it can reduce fuel consumption by a whopping 40%. Another benefit of this generator is you can turn off the Eco-Throttle feature. You would want to turn it off when you are starting something that has an electric motor. You would also want to turn it off when you are connected to a car battery. The measurements for this small generator are 19.8 inches by 13.25 inches with a height of 22.31 inches. This is definitely a compact little machine compared to other generators, especially conventional and silenced generators. It’s smaller size makes this generator great for storage and while traveling or camping. The small size doesn’t sacrifice power or fuel efficiency, either, as you’ve seen from the other benefits. Going off of the compact size, it is no wonder that this small generator is also considered to be one of the most easily portable generators on the market. Weighing only 29 pounds without fuel and a little over 30 with fuel, this generator is definitely easy to move. When you consider many generators weigh hundreds of pounds, the EU1000i is pretty remarkable. The low weight along with the compact size make the Honda EU1000i a great choice for traveling, camping, and even just in the home. Most people are able to easily lift and move this machine without difficulty. It also has a built-in carrying handle, which makes it super easy and convenient to lift and move around. You might think that a small, portable generator would be flimsy or unstable. Guess again: The Honda EU1000i is build to be sturdy and durable with a tough exterior. Honda generators are known to be great quality and strong, and this generator definitely lives up to its brand name. This generator could stand up to regular use and even a long storage throughout many seasons. The Honda EU1000i can give you stable power even after years of use. Finally, there’s Honda EU1000i’s reliability. When you think about all of the benefits — from portability to the noise levels to durability — they combine to give you a reliable and trustworthy machine. You can count on this generator to give you a stable power source for everything from your radio to your expensive, sensitive laptop. It will be ready to use when you need it most. Maybe you will use it for a power outage or a more serious weather emergency. The Honda brand is known for making machines that last for years while serving the customer well. This generator will start effortlessly to give you power when you need it the most, which is everything you could want out of a generator. This reliable, small generator from Honda is definitely one of the best portable generators you can buy. It has a variety of uses that will serve you on all of your adventures camping and your misadventures during a power outage. Figuring out which generator is right for you and your needs can be difficult, especially with the huge variety of choices on the market right now. Maybe you want a portable generator for recreation or one to have for emergency preparedness. With the recent inverter technology and the Honda brand name, the EU1000i is an excellent choice. Apparently no one told my Honda EU 1000 it couldn’t start and run a refrigerator. During Sandy and during the following week that our power was out it started and alternately ran 2 refrigerators. Once running I could turn on the computer and eventually a 65 ” TV. It is truly an amazing quiet little machine. I baby it and exercise it monthly change the oil every 3 years if it acts a bit rough it goes to The Honda repair place in East Brunswick.